Faith Davis of Logan prepares to mail her taxes at the Logan Post Office on Monday, April 15, 2019. It’s April 15, Tax Day. 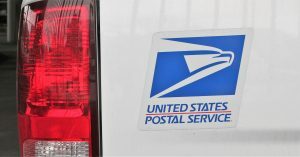 USPS and posts offices across the country are busy as citizens send their last minute taxes. 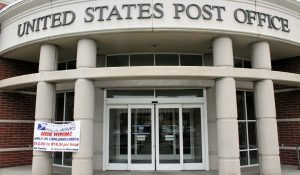 The Logan Post Office is seeing a surge in patrons Monday for people mailing their taxes on Tax Day. Ryan McLeod, a Supervisor at the Logan Post Office, said they are seeing a surge of people coming in today. Amy Spencer of the Utah Association of Public Accountants said the IRS is expecting to sift through 155 million individual 2018 tax returns this year. She said choosing e-file and direct deposit for refunds remains the fastest and safest way to file an accurate income tax return and receive a refund. The IRS has a help line to assist taxpayers by offering several ways to help people prepare their tax returns. Some people are seeing less of a return on their federal income tax than in the past, because of the early tax cuts by President Trump. Along with Federal Taxes, Utah State Taxes are due and they can also be electronically filed. The Utah State taxes codes states you must pay your income taxes by the due date. There are several freebies at fast food restaurants and other retail establishments trying to ease the pain of paying taxes. April 15, is one of the busier days at the U.S.Post Office as Federal and State Taxes are due. Here is a list of some establishments found that offer Tax Day deals. Some local businesses may not offer the discount; it may be wise to check local websites or Facebook pages to find out if they are participating in Tax Day Deals. Arby’s: Free Value Curly Fries April 15 with printable coupon. ACE Hardware: $10 off a $40 purchase. AMC Theatres: patrons can get a coupon for a free small popcorn, no additional purchase necessary. The coupon is good April 12–April 15. Chili’s: Free appetizer or dessert with entree purchase. Offer ends April 18. Cinnabon: Get two free Cinnabon Bites. Del Taco: Free beer-battered taco with drink purchase. Offer ends April 25. Kohl’s: 20% off entire purchase with a coupon, offer ends April 17. Krispy Kreme: Free original glazed donut with a regular-priced milk purchase, ends April 21. 7-Eleven: Free medium Slurpee. Check website for details. There may be more, check the website of your favorite fast food restaurant. This shows up two days later??????????? Geez, thanks!